The good: Virtual networked USB port; mobile router capability; true dual-band; intuitive and responsive browser interface; gigabit LAN and WAN; easy to set up; support separate wireless networks for guests; convenient preset settings. The bad: Slow mixed mode performance; range could be better; bulky design. We didn’t experience any problems setting up the D-Link DIR-825. The router comes with a CD that contains the D-Link Router Quick Setup desktop software. Dutifully following the wizard, we were able, with minimal mouse clicks, to get everything up and running, including connecting to the Internet and other wireless clients, as well as setting up an SSID for each frequency. Alternatively, you can use the Web-based interface, which we found to be well-thought-out, responsive, and more comprehensive than the desktop application. 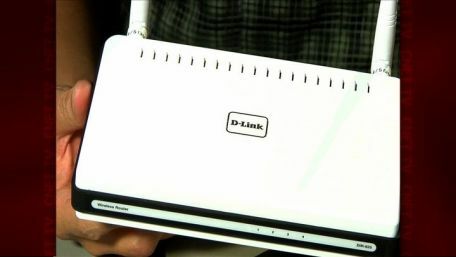 The D-Link DIR-825 looks just like the DIR-655, minus the third antenna. The two antennae, however, are still attached to the back of the router where all the ports reside. This is a cluttering and long-standing design trait found in all D-Link’s Wireless-N routers. Nonetheless, with the omission of the middle antenna, it’s much easier to get to the DIR-825’s ports than the DIR-655’s. Despite similarities in appearance, the DIR-825 is much more advanced than the DIR-655. It’s the second router from D-Link that supports true Wireless-N dual-band, capable of broadcasting simultaneously in 5GHz and 2.4GHz frequencies. (The first was the DIR-855, which we reviewed earlier this year). The DIR-825 is the first, however, to feature the SharePort technology that allows the router’s USB port to work as a networked USB port. SharePort comes with a software application called SharePort Network USB that you’ll need to install on your networked computers. The software lets the computer recognize a USB device plugged into the router as if it were plugged directly into the computer’s USB port. Unlike other USB-equipped routers that support only printers and external hard drives, SharePort lets the DIR-825 share virtually any USB device over your network. We tried the Seagate FreeAgent Xtreme external hard drive with the DIR-825’s USB port and the moment we plugged it in, the SNU utility in all the computers in the network prompted that a new device has been plugged in and asked if it should connect to it. Once we selected the computer and connected to the drive, the utility on other computers showed that the hard drive had been taken and gave an option to message the host computer to release it, which would happen if the user at the host computer agreed. We were also able to share that hard drive (as though it was connected to the computer directly) and made it available for the rest of the network to access at the same time, the same way you would share a folder on that computer. This seems to be a workaround for the above-mentioned weakness. RollinAlong said: Researched several different options for wireless networking prior to purchasing this model. I’m not overly techinical when it comes to home networking, but know enough to get myself in trouble and thankfully the ease of the router setup didn’t allow me to get in trouble. No issues with dropping the network. jack5578 said:Dual band, great User Interface, lots of bells and whistles, lots of functionality. This router has all the functionality of a more expensive “gaming router” at a much better price. This router is a great value for the price. It has all the current bells and whistles. 2.4 and 5.0 Mhz, simultaneous dual band, gigabyte ethernet ports, USB port to plug in any USB device to share. The user interface is really nice and has a lot of features to set your router up any way you want. This router has all the features of the more expensive “gaming routers”. I’m using this router for everything; web surfing, gaming, voip phone, video streaming, media server with PS3, and file and print sharing. This router doesn’t miss a beat. I have experienced no shuttering or slowdowns. Video streaming is smooth and steady, and voip calls are as clear as a landline. If you buy this router, download the latest firmware for the router on the dlink website. I struggled for two days trying to get the shared printer to work. But once I downloaded the latest firmware it worked immediately. There is a little button in the user interface that says “check for latest firmware version” or something like that. When you click it, it says you already have the latest version. That was the first thing I checked when I had problems with the printer. Two days of struggle later, I went to the dlink website and saw there was a much newer version of the firmware. So, don’t believe the little status button in the user interface, go to the dlink website and look for yourself, download and update to the latest firmware. brandnewjesus said:I love the ease of setting reservation list, prioritizing traffic, and port forwarding to have one person watching hulu and ps3 online, and bit torrent running without and lag across the house through 3 walls, 1 insulated. The share port utility is pretty useful if you just need to grab something off your drive real quick, but if your planning on using it to back up you downloaded movies its a little slow.